LonWorks to BACnet gateways, or protocol converters, translate LonWorks network variables into BACnet objects and translate BACnet objects into LonWorks network variables. The Babel Buster gateways will connect BACnet MS/TP or BACnet IP devices to a LonWork Free Topology network. The Babel Buster gateways will also connect LonWorks devices to a BACnet IP or BACnet MS/TP network. The Babel Buster gateway will function as a LonWorks to BACnet protocol translator. Data will generally end up representing the same meaning on either end, but the details of how it is transmitted on the network are different. Babel Buster gateways have the option of applying data conversions on the fly which are almost always necessary for translating network variables to BACnet objects or vice versa. LonWorks to BACnet gateways from Control Solutions are economical and easy to use. Configuration software is provided which you may download at no cost. Online user guides and videos are provided to get you up and running as quickly as possible. There are no additional drivers or software to buy. The behavior of the LonWorks to BACnet gateway, or BACnet to LonWorks gateway, is very different depending on whether you are putting LonWorks devices on a BACnet network, or putting BACnet devices on a LonWorks network. The Babel Buster gateway is used to connect BACnet devices to a LonWorks network in a manner that makes those devices behave like LonMark certified sensors and actuators. The Babel Buster LonWorks Gateways themselves are LonMark Certified, based on the LonMark sensor and actuator functional profiles. The gateway’s implementation of sensor and actuator simply leaves the door open for you to define what the actual sensor and actuator physical hardware consists of. In this case, the sensors and actuators physically consist of BACnet objects in other devices. The LonMark Certified Babel Buster gateways are intended to be commissioned on a managed LonWorks network using a commissioning tool such as Echelon’s LonMaker or other equivalent tool. The standard network variable binding process is used to effectively connect BACnet devices via the gateway to other LonWorks devices on the LonWorks network. The non-bound LonWorks to BACnet gateway is a BACnet client/server used to connect LonWorks devices to a BACnet network without binding or LonWorks network management outside of the gateway’s own capabilities. The LonWorks network variables will be polled periodically to read LonWorks data, or updated upon change in value (or periodically if chosen) to write LonWorks data. Data read from LonWorks will be placed into BACnet Input or Value objects. Data written to BACnet Output or Value objects will be written to LonWorks network variables. Many LonWorks network variables are a single data value, such as temperature. However, many other LonWorks network variables are ‘structured’, meaning a single variable contains several related data values such as in the HVAC status variable. BACnet objects, on the other hand, always contain exactly one and only one data value. This means a single structured LonWorks variable cannot be translated to a single BACnet object. 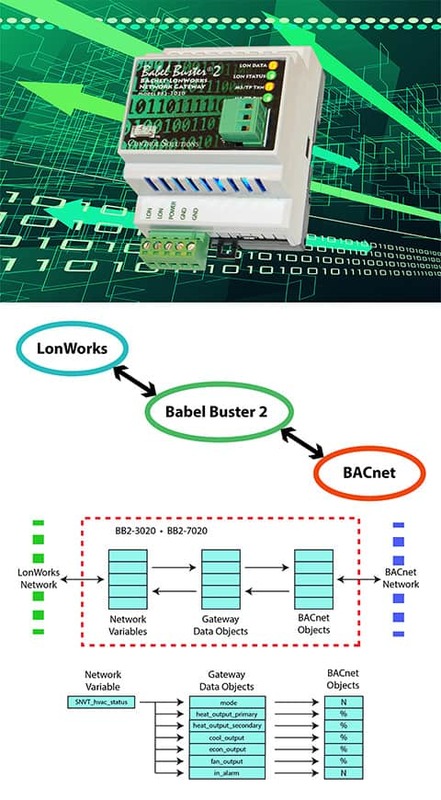 The single structured LonWorks network variable must be translated to or from multiple BACnet objects, and the Babel Buster gateway automatically handles this translation.